The iconic packaged goods company may have decided to settle with a well-known dissident director as it prepared to release its weak quarterly results. Nelson Peltz, activist investor and incoming P&G board member. Procter & Gamble Co. (PG - Get Report) on Tuesday beat expectations for earnings per share, met key forecasts for organic revenue growth and hiked its share repurchase program. All good? Not so much. By the end of the day, the iconic packaged goods company's share price was down about 3% to $89.05, dropping further by Friday to $88.34 a share, all of which suggests that shareholders and analysts weren't impressed. P&G's second-quarter results emerge, of course, as Procter & Gamble prepares to bring on an extremely high-profile dissident director, activist investor Nelson Peltz. The company last month brought to a close a multi-million-dollar, nearly year-long proxy contest, the largest in the history of boardroom battles, by agreeing to add Peltz, even though an inspector of elections had his opponent up by a slight margin. Peltz is scheduled to join March 1. The alternative would likely have been lawsuits and vote count challenges. For some analysts, the results will give Peltz ammunition as he pushes for dramatic changes at the company, potentially including a restructuring the insurgent investor has been seeking that would reduce the number of the company's global business units four to three. If not that, then perhaps Peltz will now have some leverage for his push to revamp P&G's R&D program or his effort to refocus the company's acquisition strategy. In fact, analysts privately and publicly suggested that expectations for a mixed quarter likely helped convince P&G CEO David Taylor to give in and settle with Peltz. "It may have been partly in anticipation of these results that P&G stopped fighting Peltz and put him on the board," said Ali Dibadj, an analyst at Bernstein. "As the company checks the boxes on operational things they are fixing, it points more and more clearly to organizational problems." Dibadj suggested that P&G had a lot of excuses for what he argued was a mediocre quarter. 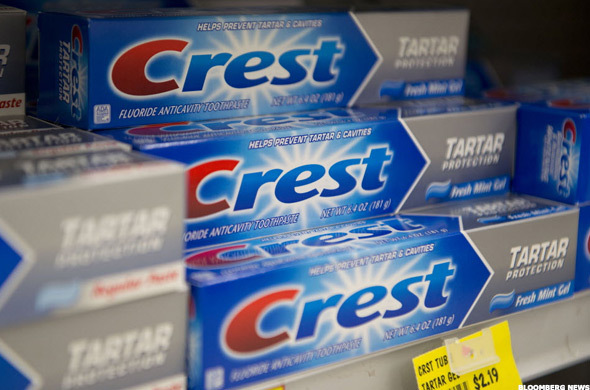 He put a spotlight on P&G's suggestion that the company was facing some headwinds, partly from a large retailer de-stocking its shelves, lowering their inventory level, and an Algerian ban on finished product imports in the company's packaged-goods categories. "‎Algeria is a tough excuse given how small it is," Dibadj said. "Investors are unhappy about a list of what is perceived to be excuses by the company. Algeria, destocking. Other companies haven't talked about these types issues." Analysts noted that the $1.19 a share earnings beat -consensus estimate was at $1.14 a share - was enabled partly by sweeping corporate tax cuts approved last month. Renmac consumer packaged goods analyst Aril Scee suggested that the beat was due to "tax reform benefit," which also impacted its fiscal 2018 guidance. Another key issue for Dibadj: P&G's negative pricing, which means the average price of goods is declining, perpetuating his analysis that the company has been aggressively promoting its products. "It's likely something they have to do, but we wish it were otherwise," Dibadj said. "In this environment as input costs are higher, while pricing is down, their margins will be squeezed. A broader issue is simply whether P&G has lost pricing power." P&G also moved forward only slightly in other key areas that are clearly on Peltz's radar. The activist and his team at Trian Fund Management have complained that significant acquisitions in the past have done poorly because the company wasn't focused enough on the competition. P&G's Gillette, for example, which it acquired in 2005, has had difficulty competing with Harry's and Dollar Shave Club in recent years. The company in April implemented a 12% price reduction on average for Gillette products, including razors, which it says has begun to show results. Overall, the grooming segment was down 3%, which wasn't as bad as the consensus estimate expectation of down 5%. But Dibadj said he wasn't so sure that the results in grooming were anything to be happy about. "They are still losing market share," he said. As Peltz gets ready to join, expect P&G directors to engage in a heated debate over subcommittee assignments. Installing Peltz on P&G's four-person innovation and technology board subcommittee would be a clear indication that directors are ready to listen to his recommendations on R&D reform. Peltz had been seeking a wholesale re-evaluation of P&G's R&D strategy, something that Taylor has suggested would be "very dangerous" and result in the complete elimination of the R&D department. Don't expect the activist investor to be appeased by R&D-driven innovations in recent months, including P&G's recently touted Olay cell science product, its super peptide formula, which purportedly delivers "visible skin transformation in 28 days." For now, expect Peltz to be watching. Take a look back at TheStreet's Executive Editor Brian Sozzi's interview with P&G CEO David Taylor at the height of the battle with Nelson Peltz.